The Southern Sparsely Populated Areas network (SSPA) participated yesterday, June 12, in a conference in Astorga (León) in which the keys of depopulation were analyzedto help curb the loss of population in the rural areas. 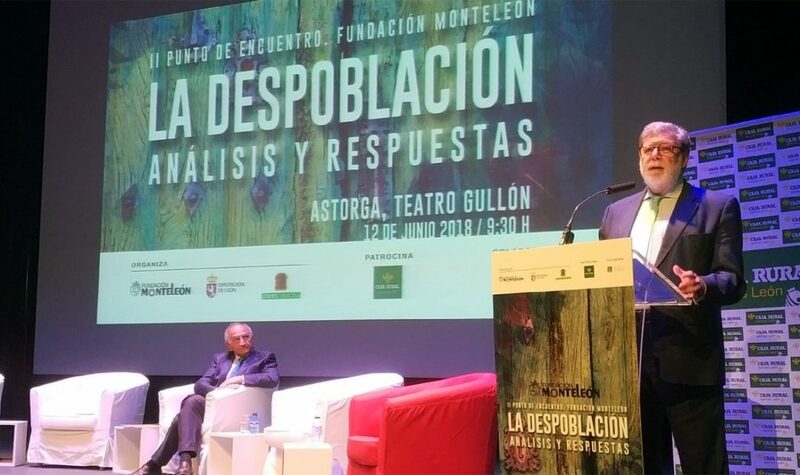 The II Meeting of “Depopulation: analysis and answers” has been organized by the MonteLeón Foundation, the Provincial Council of León and the City Council of Astorga. The program has counted with the participation of the representative of the SSPA, Santiago Aparicio, presidentof the Federation of Sorian Business Organizations (FOES). In his speech, Aparicio presented to all attendees the SSPA network, transferring the proposals that the organization has for Spain. A document that collects the contributions and suggestions, translated into concrete measures, in various areas such as the institutional, financing, fiscal, legislative, business, infrastructure and cultural. In addition, he also presented the keys to success of the Scottish project with which the process of depopulation of the Highlands and Islands of Scotland was reversed. Among other speakers, the day counted with the participation of political representatives of the autonomous community of Castilla y Léon, professors from different Spanish universities who are experts in demographic matters, representatives of associations, businessmen, journalists and writers specializing in depopulation. With this event it has been tried to establish a deep debate on depopulation. The conclusions of this forum will serve as the basis for proposing effective measures to reverse the depopulation process that sparsely populated territories with serious and permanent disadvantages are living.